The Israel Defense Forces destroyed a tunnel built by Hamas that crossed from Gaza into Israel, like reported by jta.org. The tunnel originated in the Khan Younis area of the central Gaza Strip and stretched more than 200 yards into Israeli territory. 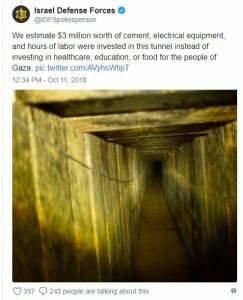 The tunnel was nearly one-mile long and branched off in several places to connect it to the network of Hamas tunnels under Gaza, the IDF said. It also was equipped with power and telephone lines, according to the IDF spokesman. 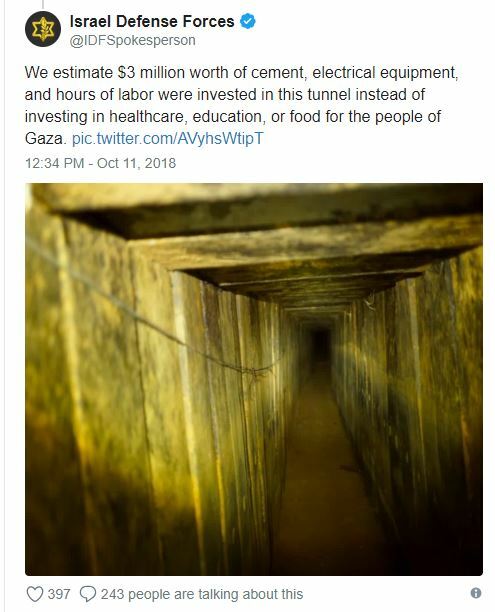 The IDF spokesman’s office noted in a tweet that Hamas, which runs the Gaza Strip, invested some $3 million worth of cement and electrical equipment, as well as hours of labor into the tunnel. “Today, we can say we have newly improved technological means for the discovery, location and thwarting of tunnel activity,” said IDF Spokesman Brig. Gen. Ronen Manelis. “The Hamas terrorist organization continues to invest considerable resources in establishing infrastructures aimed at harming Israeli citizens. This economic investment, which comes at the expense of the well being of residents, is a sign for the Strip’s inhabitants that their regime prefers to invest in terror rather than in other things,” he said. It is the 15th tunnel that the IDF has located and destroyed in the last year, part of a network of Hamas tunnels designed to enable the terrorist group to launch attacks on southern Israeli communities, the IDF said in a statement. Hours before the announcement of the destruction of the tunnel, on Thursday morning, the Iron Dome missile defense system was activated, causing Code Red rocket sirens to sound in several Israeli communities located near the border with Gaza. The army said that the system was triggered accidentally and that no rockets had been fired from Gaza at Israel.